Singapore — The disaster response team from Singapore’s Corporate Citizen Foundation (CCF) returned from Chennai last Friday (11 Dec 2015), at the close of the state of emergency there. While most parts of Chennai are now seeing dry grounds, the communities residing along and around the rivers are trying to resume with their daily routines as they struggle to clear the huge amounts of debris and mud that have penetrated and surrounded their homes and vicinities. (left) Streets near Coovum river still submerged. (centre) Houses along and around Coovum river have had flood waters and muds penetrating their homes and destroying their belongings. (right) Residents near Cholaimedu sweating together to clear the heaps of debris and mud surrounding the vicinity of their homes. The CCF team had earlier brought from Singapore half-tonned of relief items ‎comprising 4 units of manual-powered water filtration systems (that churns 1,000 litres/hr), 1,000 collapsible jerry cans and 2,000 disposable underwear.‎ In addition to the relief items being flown in free by Singapore Airlines, the airline’s ground staff lent their hands with the cargo handling in Singapore and Chennai. Having sought advanced permissions separately from the Commissioners of Customs and the ‎Revenue, and securing support from the Indian High Commission in Singapore, the team cleared Customs in Chennai within 30 minutes. Through its local NGO partner, Annai Illam, the CCF team procured hygiene essentials including 1,000 packs of sanitary napkins; 1,000 bath towels; 1,000 lungi‎ (sarong) and 500 pieces of kids’ wear. These items were procured from the neighbouring state of Bengalore, and were distributed to the communities at Arumbakkam, Apparov Garden near Cholaimedu and Manali in North Chennai. 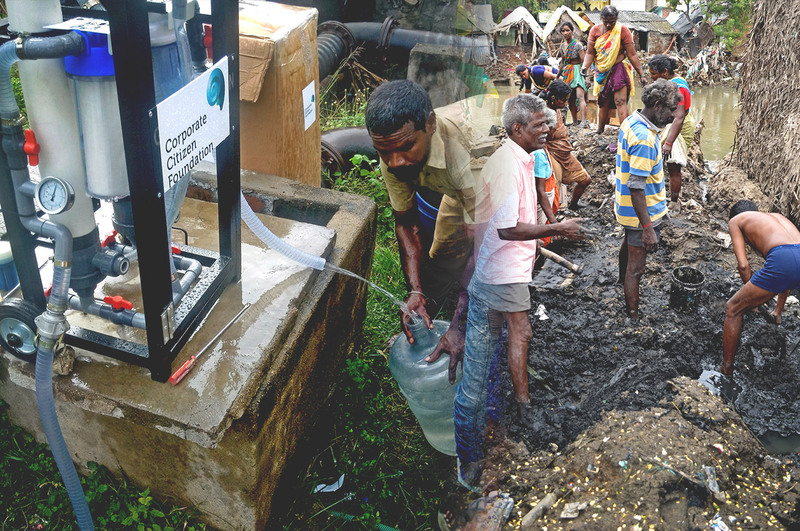 Meanwhile, the manual-powered water filtration systems were deployed at Kannagi Nagar resettlement colony and Pallavaram. Jerry cans were provided to the communities for collection and storage of the cleaned water‎. (from left to right) Setting up of water distribution centre at Kannagi Nagar; Water collection at Kannagi Nagar; Water, water everywhere, but just so much to drink; Distribution of hygiene essentials at Arumbakkam area‎. The Corporate Citizen Foundation (CCF) was officially launched by Singapore’s Deputy Prime Minister Tharman Shanmugaratnam in October 2014. It seeks to be the catalyst for proactive and constructive corporate collaboration for a better, safer and friendlier Asia. Initiated and seed-funded by HSL Constructor, the CCF is a private sector initiative to pull and pool together appropriate corporate assets to help improve the capacity and resilience of vulnerable communities in Asia, through sustainable livelihood programmes including disaster preparedness and response. The CCF had established the Swift Emergency Evaluation Deployment (SEED), as its first responders for early access into and appropriate intervention at disaster-affected areas. SEED is simultaneously tasked to evaluate and disseminate first-hand information to incoming aid responders for more informed strategic decisions. Hence, the SEED’s slogan – Bridging the First Mile. SEED’s pioneer partners include the Pacific Flight Services of ST Aerospace (aerospace); Channel NewsAsia of Mediacorp (communications); Golden Season (water) and HSL Constructor (engineering). Thus far, the CCF and SEED have responded to super typhoon Hagupit in the Philippines (Dec ‘14), the massive Kelantan floods in Malaysia (Dec ’14), and the Gorkha earthquake in Nepal (Apr ‘15). © 2019 Corporate Citizen Foundation. All Rights Reserved.